Take a walk through this stunning 5BR/4BA Brookhaven home built in 2006 via the hosted VIDEO TOUR with Collette McDonald! This home features soaring ceilings on both levels, gracious trim details and hardwood floors. 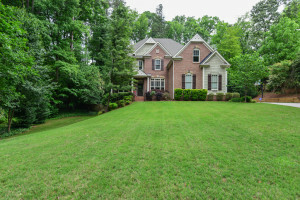 It includes a front porch, foyer, dining room, office/guest room, full bath on the main, family room, keeping room, open kitchen with granite countertops, breakfast bar, breakfast area, SS appliances and a walk-in pantry. The master suite includes a sitting room, wardrobe room, spa-style bath with dual vanities, jetted tub and oversized shower. The upper level has a large bonus room, and the secondary bedrooms are bright and so spacious! HUGE unfinished basement is stubbed for a bath and framed. This home also has a great deck and a private, fenced backyard plus a 3-car garage!